TS TRT SA P.Ed Answer keys / TSPSC TRT SA P.Ed Anwer keys /TSPSC SA P.Ed Teachers Recruitment Test(TRT) Exam Answer keys, Results 2018 /TSPSC SA Physical Education Teachers Recruitment Test(TRT) 2017 Notification/ TSPSC Teachers Recruitment Test/TS TRT/TS DSC Exam dates, Last date to apply: TSPSC SA Physical Education Teachers Recruitment Test(TRT), TSPSC SA Physical Education Teachers Recruitment Test Online application form, TSPSC SA Physical Education Teachers Recruitment Test Hall tickets, TSPSC SA Physical Education Teachers Recruitment Exam date, TSPSC SA Physical Education Teachers Recruitment Exam Results, Selection list Results, Certificates Verification Dates, TSPSC SA Physical Education Teachers Recruitment Test Main Exam dates, TSPSC SA Physical Education Teachers Recruitment Test Preliminary Exam Results, TSPSC TRT SA Physical Education Main Exam Results, Main Exam Preliminary key, Final Key, TSPSC TRT(TS DSC) SA Physical Education Notification, TSPSC SA Physical Education Teachers Recruitment test Schedule, TSPSC SA Physical Education Teachers Recruitment Information Bulletin, TSPSC SA Physical Education Teachers Recruitment Eligibility Criteria/ Post wise Qualifications, How to Apply-Apply online-User Guide for TSPSC SA Physical Education Teachers Recruitment test, Exam pattern, Syllabus Structure and Content for TSPSC SA Physical Education Teachers Recruitment Test, District wise and Category Posts Wise SA Physical Education Teacher Posts Vacancies for TSPSC SA Physical Education Teachers Recruitment test, TSPSC SA Physical Education Teachers Posts Direct Recruitment(Scheme of Selection) Rules, 2017 and more details to be available on TSPSC Web portal. TSPSC TRT Final Answer keys to be released on May 3 and TSTRT Anwser keys download from May 3. TSPSC has conducted written examinations for the above notifications from 24/02/2018 to 04/03/2018. The Final Keys of these exams will be available on TSPSC website from 07/05/2018. For further details please visit www.tspsc.gov.in. No further objections will be entertained on Final keys. TSPSC has conducted written examinations for the above notifications from 24/02/2018 to 04/03/2018. The Final Keys of these exams will be available on TSPSC website from 03/05/2018. For further details please visit www.tspsc.gov.in. No further objections will be entertained on Final keys. 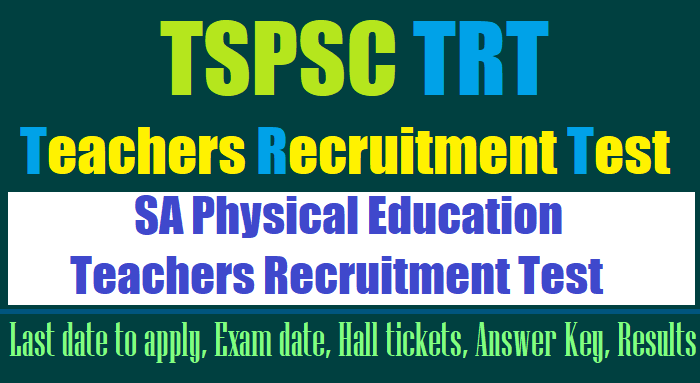 TSPSC TRT Answer Keys, TS TRT Answer Keys, TS Teachers Recruitment Answer key, TSPSC SGT, SA, LP, PET, SA P.Ed Teachers Recruitment Answer Keys..
TSPSC has finalized the Preliminary keys of the Teachers Recruitment Test (TRT). The primary key of TRT is to be available on the official website of TSPSC from 14-03-2018. Candidates can raise objections from 21 to 31 this month through online mode. The TRT tests was conducted from February 24 to March 4, 2018. The candidates who have appeared for the post of School Assistant (52/2017), Secondary Grade Teacher(53/2017), Language Pandit (54/2017) , School Assistant (Physical Education) 55/2017 and Physical Education Teacher (56/2017) in School Education Department are hereby informed that Answer keys of the TRT examinations can be downloaded from 14th March 2018 onwards. Answer Keys for other examinations will be available for download from 14th March 2018 onwards. The candidates who have applied for the post of School Assistant (52/2017), Secondary Grade Teacher(53/2017), Language Pandit (54/2017) , School Assistant (Physical Education) 55/2017 and Physical Education Teacher (56/2017) in School Education Department are hereby informed that Hall Tickets for the examinations scheduled on 24th and 25th Feb 2018 can be downloaded from 7 PM on 19th Feb 2018 onwards. Hall Tickets for other examinations will be available for download from 9 PM on 20th Feb 2018 onwards. Assistant (Physical Education)in pursuance of The Telangana Direct Recruitment for the posts of Teachers Rules, 2017 issued vide G.O.MS.No.25 School Education (General) Department, Dt: 10/10/2017,and subsequent Amendment issued vide G.O.Ms.No.33 School Education (General) Department, Dt: 11/12/2017 and that when some candidates approached the Hon’ble High Court seeking relief for the candidates with D.Ed., (Special Education) or B.Ed., (Special Education), the Hon’ble High Court granted relief to the candidates in its interim orders Dt:14/11/2017. Accordingly School Education (Genl) Department Government of Telangana in its Letter No.9286/SE.Genl/A1/2017 ,Dated07/12/2017 has quoted the Hon’ble High Court. “Clause 3 of the Notification dated 23.08.2010 stipulates the training to be undergone and, under clause 3 (b), a person with D.Ed ( Special Education) or B.Ed ( Special Education) qualification shall undergo, after appointment, an NCTE recognized special programme in Elementary Education. The requirement of undergoing a 6 months special programme in elementary education is after a candidate with D.Ed.,( Special Education) or B.E.d., (Special -Education) is appointed as a teacher”. Further in the letter Government informed that candidates who acquired B.Ed qualification in Special Education / 2 Year Diploma in special Education are allowed for recruitment in General Schools. In view of the above the following Corrigendum is issued for information of the candidates. Reservation to Local candidates: It was notified that the post is of District cadre and 31 are the Present Districts in Telangana State. As per Rule 6 of G.O.Ms.No. 25 School Education (General) Department, Dt: 10/10/2017. Adilabad (ADB), Karimnagar (KRMR), Warangal (WGL), Khammam (KMM), Ranga Reddy (RRD), Nizamabad (NZB), Mahaboobnagar (MBNR), Medak (MDK), Nalgonda (NLG) and Hyderabad. (HYD). In view of the above Corrigendum, the qualifications mentioned in the application form, for the post applied for, shall be taken into consideration for the purpose of selection. The last date for submission of online applications is extended up to 307-01-2018. The Candidates who have already applied based on 31 districts need not apply again for the same post. However their district information in the application forms already submitted have to be changed as per 10 Districts. The “District Edit as per 10 districts” will be available from 15/12/2017 to 26/12/2017 on the website. Note:- All the Candidates who have submitted applications shall change the district details without fail by updating their OTR details. The other details for Notification No.56/2017, Dt: 21/10/2017 are available in the commission website (http://www.tspsc.gov.in). Examination centers were established at Ranga Reddy, Medak, Karimnagar, Warangal, Hyderabad, Khammam and Nallagonda. Online, Offline examinations are conducted. Telangana State Public Service Commission is releasing today 5 notifications for Teachers Recruitment Test (TRT) for 8792 vacancies. Teachers Recruitment Test was entrusted to TSPSC vide G.O.MS. No. 19 School Education (General) Department, Dt: 18/05/2016 and Finance Clearance was given vide G.O. Ms. No.129 Finance (HRM-H) Dept Dt.01/09/2017. TSPSC has prepared the notifications in accordance with the Teacher Recruitment Rules-2017 issued by the Government of Telangana vide GO Ms No.25, School Education (General) Department, Dt. 10.10.2017. For the first time TSPSC is conducting the Teachers Recruitment Test for 31 Districts, If a candidate is eligible for more than one notification, he should apply separately for each notification. The applications will be accepted from 30/10/2017 to 30/11/2017. The dates for exam will be in the Vd week of February, 2018. t It should be noted by the candidates who apply for School Assistants, Language Pandits and Secondary Grade Teachers that 80% weightage will be given for written test and 20% weightage for Teachers Eligibility Test (TET) Further for the posts of PET and School Assistants (Physical Education), the selection will be based only on the merit in the written exam and no weightage will be given to the TET. The notifications are hosted on TSPSC website: WWW.tspsc.gov.in. TSPSC Notification No. 55/2017, Dt. 21/10/2017: Teacher Recruitment Test In School Education Department School Assistant (Physical Education): Applications are invited Online from qualified candidates through the proforma Application to be made available on Commission’s WEBSITE (www.tspsc.gov.in) to the post of School Assistant (Physical Education) in School Education Department. EDUCATIONAL QUALIFICATIONS:Applicants must possess the qualifications from a recognized University/ Institution as detailed below or equivalent thereto, as specified in G.O.Ms.No.25 School Education (General) Dept., Dt.10/10/2017 as on the Date of Notification. ii. Must possess Graduation in Physical Education with 40% marks (In case of SC / ST / BC, the minimum marks shall be 35%) OR Graduation in Physical Education i.e., B.P.Ed, course of three years duration. iii. Must possess a Bachelor's Degree with minimum 50% marks(In case of SC/ST/BC, the minimum marks shall be 45%). Bachelor of Physical Education (B.P.Ed.) of at least one year duration from any institution recognised by NCTE. The candidates who have (i) passed either SSC (or its equivalent) Examination or Intermediate (or its equivalent) or Degree Examination in the medium of instruction concerned or (ii) have studied the Language concerned as First Language in SSC (or its equivalent) or as Part I in Intermediate (or its equivalent) or as Second Language in Intermediate (or its equivalent) or as a Subject in Degree are eligible for the posts of SA (Physical Education), in the concerned medium school. The Medium of the TRT Question Paper shall be the same as the Medium of the Post opted for. NOTE:- Subject wise and Medium wise vacancy position is available at ANNEXURE-I and candidates may apply as per the vacancy position in their concerned subject. AGE:Minimum 18 years & Maximum 44* years. The age is reckoned as on 01/07/2017 (Rule- 12(1)(a)(v) of State and Subordinate Service Rules). Minimum Age (18 years): A Candidate should not be born after 01/07/1999. Maximum Age (44 years): A candidate should not be born before 02/07/1973. The Upper Age limit will be relaxed as per Rules and will be calculated on the above lines. 1. Telangana State Government Employees (Employees of TSRTC, Corporations, Municipalities etc. are not eligible). 5 Years based on the length of regular service. 2. Ex-Service men 3 years & length of service rendered in the armed forces. 3. N.C.C. (who have worked as Instructor in N.C.C.) 3 Years & length of service rendered in the N.C.C. FEE:(Remittance of Fee) Each applicant must payRs. 200/- (RUPEES TWO HUNDRED ONLY)towards Online Application Processing Fee, each subject applied for. This apart, the applicants have to payRS. 80/- (RUPEES EIGHTY ONLY)towards Examination Fee. However, the following category of candidates are exempted from payment of Examination fee. N.B. :- BC’s, SC’s and ST’s belonging to other states are not exempted from payment ofApplication processing Fee and Examination Fee and they are not entitled for anykind of reservation. The Fee mentioned at Para-I(6)(a) is to be paid online through SBI ePay duly following online instructions once the application form details are submitted by filling TSPSC ID, date of birth and other particulars. The fee once remitted, shall not be refunded or adjusted under any circumstances. Failure to pay the examination fee, application fee, wherever applicable will entail total rejection of application. The list of Banks providing service for the purpose of online remittance of fee is given inANNEXURE – II. 1. a) For SA, SGT, LP: Those candidates who qualify in the Examination (Objective Type) in order of merit by giving 80% weightage for written test and 20% weightage marks in TET Paper-II put together will be called for verification of Certificates, Community and Category wise for the vacancies available as required. The minimum qualifying marks for Selection are OCs 40%, BCs 35% SCs, STs and PHs 30%. The minimum qualifying marks are relaxable in the case of SC/ST/BC/PH at the discretion of the Commission. b) For SA Physical Education, PET: Those candidates who qualify in the Examination (Objective Type) in order of merit will be called for verification of Certificates, Community and Category wise for the vacancies available as required. The minimum qualifying marks for Selection are OCs 40%, BCs 35% SCs & STs 30%. The minimum qualifying marks are relaxable in the case of SC/ST/BC at the discretion of the Commission. 2. The candidates will be selected and allotted to Service/ Department as per their rank in the merit list and as per District preference for allotment of candidates against vacancies and for the vacancies available. N.B : Mere securing minimum qualifying marks does not vest any right in a candidate for being considered for selection. 3. The appearance in all the papers at the Written Examination as per rules is compulsory. Absence in any of the paper/papers will automatically render his candidature as disqualified. 4. Candidates have to produce Original documents and other particulars on the day of verification itself. If candidate fails to produce any of the required certificates and if the particulars furnished by him / her in the Application do not tally with the Original documents produced by him / her, then his / her candidature will be rejected/disqualified without any further correspondence. As candidature for the recruitment is processed through Computer/Electronic devices based on the particulars furnished in the Application Form, the candidate is advised to fill in all the relevant particulars carefully. 5. The preference opted by candidates in respect of posts, District etc., in the application form are only indicative for being considered to the extent possible but not binding or limiting the Commission’s powers conferred under Article 315 and 320 of the Constitution of India. Therefore, the Commission has the power to assign a successful candidate to any of the notified posts for which he/she is qualified and eligible, subject to fulfilling the selection criterion. Mere claim of preference for any District for allotment against vacancy does not confer a right to selection for that District in particular or any District in general. 6. The appointment of selected candidates will be subject to their being found medically fit in the appropriate Medical Examination, and if he/she is of sound health, active habits free from any bodily defect or infirmity. application according to the guidelines provided at the time of registering for applications on Website. While filling the application form, the candidates have to ensure that there are no mistakes in it. The Commission bears no responsibility for the mistakes, if any, made by the candidates. The Examination (Objective Type) is likely to be held held in 2nd week of February 2018. The Commission reserves the right to conduct the Examination either COMPUTER BASED RECRUITMENT TEST (CBRT) or OFFLINE OMR based Examination of objective type.